"That is a great question. If I could bring anything it would be my "Thinking Cap". I always need to think hard when it comes to saving the island and also bringing a fish and squid pizza(Mmm!) would keep me from being hungry the whole time! But if I had to choose one it would be my good thinking skills. " Since so many penguin love going on adventures, Club Penguin wants to know WHO you want to go on an adventure with you for next weeks Reviewed By You. Put your answer in a comment here, and if yours is chosen, you could earn 10,000 coins! Cool? I'd bring geeny so I could wish for things,then wish for more wishes. 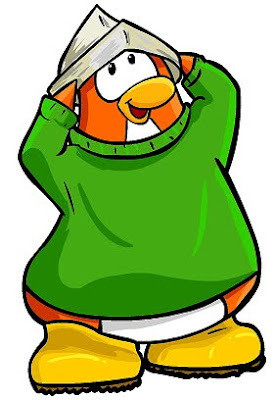 If I had to go on an awesome adventure I'd bring Mimo777 and his gang all to Rockhopper's Island.We would all talk to Rockhopper, then go back to Club Penguin and go on a journey to find Herbert! Lol! I would wish for a monkey if I had a genie! Yeah, I submitted a... whatever you call it! Cool, I already did! Keep commenting! That would be pretty sweet! Just roasting some food with your friends. Then it getting eaten by a monkey! Sorry, but you gotz ta love the monkey! Kidnapper! You would steal Mimo and his... here it comes... bad pun... Club Penguin Gang! Sorry, I just had to! Yeah, it's a pretty saweet post! Nobody could! Not even Bob the magical talking tree! No, silly I am talking! Bring us back some monkeys and bananas. Reasons Unknown... Enough said! Waddle On! ~~~~~~~~~~~~~~~~~~~~~~~~~~~~~~~~~~~ya mimo freak herbert out with your weirdness!lol he will leave cp and youll be a hero!! ~~~~~~~~~~~~~~~~~~~~~~~~~~~~~~~~~~~even if you were sick and ill and old and dieng i wouldent miss out my last chance to have one ps im not old! i would bringmy trusty sword to rockhopper island then find a puffle and have awsome adventures! I would take my best friends Jimmy, Mandy, and Jared all with me to Hawaii and chill. Then, we would go to Florida and have a bunch of fun riding rollercoasters! Then, we would all go to my house with their laptops and play club penguin. Then, we would go check out Mimo's cheat site and comment on a bunch of stuff. After that, I would get a geniee lamp and give all of my best friends one wish. Then, we would go on an endless shopping spree. cool! i would probably bring my puffle grapey! A thinking cap would truly be nice to have, in addition to those the propeller hats. An adventure party would be nice to have. I would bring famous clubpenguin people. I think so. I'd bring my friends, too! That'd be exciting! Why don't we call the tree outside the mine Bob, and build a legend around it. Bob was a sapling that originally grew in front of the magical-mirror-that-always-tells-the-"truth"-during-the-medieval-festival. It knows the truth about why Aunt Arctic has Spy Glasses, and why G. invented a fan, when it's already freezing in CP. Just a friendly reminder, this will make you a better moderator! Wow! Moderators are looking forward to comments to reply! I think so! All my friends ROCK! :D LOL. A Puffle to find food or... a puffle for food? LOL! What a long great story! ~~~~~~~~~~~~~~~~~~~~~~~~~~~~~~~~~~~is it made of candy??? ~~~~~~~~~~~~~~~~~~~~~~~~~~~~~~~~~~~ya!monkeys with bannanas that fly! Card Jitsu water will be avaliable in June or July of 2010. Club penguin will flood leading to the Water Party(last mission of herberts revenge). Gary will create a device that drains the water, leading to the discovery on the Water Dojo. Card Jitsu Snow will be Avaliable in November 2010. An avalanche will cause disruptions around Club Penguin. The sensei will call all ninja to help dig around the avalanche leading to the discovery of the snow dojo. please dont put cph mod unless ur answering a question or giving advice! Whoa! Smart person alert! That's awesome! Yup, puffles rock! They always use them in Herbert's Revenge, so why not? Wow! That's a lot to bring! That's sounds really cool, keep commenting! I stole that hat. Lol. Grapey? Lemme guess, it's purple! It is? I mean, it is! But let's focus on the more important stuff, like chicken! Whoa! We should have a propellor party! That would be addicting. What happened here? I will find this comment! i'd bring timmy the magical turtle! Ok i have to off topic questions. Alot of people said the old Clubpenguin owners are coming back in a few months because Disney is quitting Cp. Is this true? Also alot of people say they email clubpenguin what rare items are coming out and Disney gives them a list like, Red Lei, Orange Waterwings, Green Shades , ect. Do you think this is true?? I hope so1 That would bring more people back. I would bring a panda...then I would make it into a panda steak. Thats also what I would do if I won the lottery. Sort of get it... Not really though. Are you talking about gang as in the apple dumpling gang? I like that movie XD Don Knotts and Tim Conway are the UBEREST commedians EVAR! Oh ya hey Mimo what ever happened to monthly mod changes? Kingkangaroo spelled it wrong. It's a genie. As is a genie in a bottle. With a side of mustard flakes and an order of thermometer brand cereal ice pops! Ok, im not going to try to get what I just said. I remember Mimo saying on Wiglington and Wenks that the monthly mod changes are monthly but he didn't say what day. There is? There doesn't have to be if you just believe in yourself! Yea ok, nevermind. Waddle On! I don't remember if this is from another mission, but I think it's new. It most likely has to do with the new mission. mimo777-You know this is realy a nice veiw. me santa-How are you breathing and how can you sea i mean your wearing sunglasses not goggles!